Attend Coastal Commission Hearing—this is the BIG ONE!! Join hundreds of Surfrider Foundation activists and other opponents of the toll road at the CCC hearing. This is it!!!! This meeting could help decide the fate of our beloved Trestles/San Onofre State Beach. As you may know, it’s very challenging to know how long the meeting will take. Public hearings can take a few hours, or can go into the night. Our best advice is to be flexible and put positive energy toward the meeting ending in a timely fashion. But also be prepared to stay late. If you are driving yourself, please note there is a $9 parking fee. This is a once in a life time chance to be part of such a HUGE meeting. We anticipate hundreds of people will attend. We truly appreciate your flexibility and willingness to take time off of work to show your support for Trestles and San Onofre State Park. When: Wednesday, February 6, 2008. Please arrive by 9am. Thanks again for your support! Please spread the word to your friends. We need to break a record. Join Surfrider and Sierra Club activists this Saturday (February 2) at 11am for a demonstration to Save Trestles and San Onofre! The last few days and hours before the Coastal Commission hearing are crucial-- and we must be highly visible! . We’ll be waiving signs, holding surf boards and constructing miniature tents to demonstrate how the toll road will ruin the camping and surfing experience at San Onofre State Beach. And we need you there! Meet us at Staple’s parking lot in San Clemente at 11am on Saturday Feb 2. Take the AVE PICO exit, EXIT 76. Turn LEFT onto E AVENIDA PICO. Turn RIGHT onto E AVENIDA PICO. 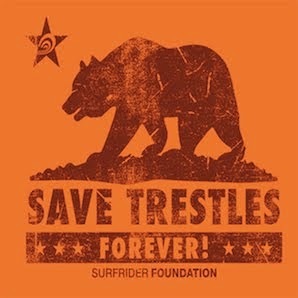 The time to Save Trestles is now!! On Wednesday, February 6, the California Coastal Commission (CCC) will hear the application for the Foothill-South toll road that will run through San Onofre State Park. This project threatens precious coastal open space, water quality and the surf break at Trestles, and it would set a dangerous precedent for YOUR State Park system. Join hundreds (if not thousands) of Surfrider Foundation activists and other opponents of the toll road for a rally at the CCC hearing. Come help us send a clear message that our State Parks and open spaces deserve saving! This is literally THE most important hearing in regards to protecting Trestles and San Onofre State Park. We need an enormous crowd to attend. Please help spread the word to all your family and friends in Southern California. The Surfrider Foundation and partners are renting buses and organizing carpools in San Clemente and San Diego. We are also providing food, tee shirts, and posters/sign for all supporters. Surfrider has it all organized—you just need to show up. Where: Del Mar Fairgrounds—at Wyland Hall 2260 Jimmy Durante Blvd. Del Mar, CA 92014 - Just off the I-5 in Del Mar at Via de la Valle exit.Visit the Fairgrounds website for complete directions. Please consider carpooling. Due to the expected large crowd the Coastal Commission just announced they are moving the hearing to the Del Mar Fairgrounds, still on February 6th. Please arrive by 9am. Watch for more details soon. I want the "Save San Onofre State Beach" surfboard returned to me. I gave you that board as a gift, but due to your recent actions and words that have the intent to destroy most of that state park, you do not deserve to have it. That board was signed by hundreds of campers and surfers that you have now betrayed. I will be at the state capitol this Tuesday morning, and can pick it up at that time. Look for me at one of the tents on the capitol lawn, or let me know where I can pick it up. Tell the Governor we want Ed’s surf board and our State Parks back! I am writing in response to your letter to the California Coastal Commission, urging them to support the Toll Road through the San Onofre State Park and Beach. I strongly oppose your decision, and the toll road that will destroy California’s fifth most visited state park. Voters established the Coastal Commission to be independent and nonpolitical, and decide on the future of our coast based on the facts and the law. San Onofre State Beach gets over two million visitors to the beach portion each year, and over one hundred and sixty thousand visitors to the park’s two campgrounds. There are many reasons for the popularity of this beach and park. Since it was recognized as a State Beach in 1971, San Onofre has attracted surfers with its outstanding surf, quiet, accessible inland campground (in close proximity to the beach), and an environment that offers Southern California families the opportunity to experience the coast and nature in the middle of an otherwise overwhelmingly urban area. Email it here: http://gov.ca.gov/interact Be sure you use the drop down menu and pick “San Onofre Toll Road” and check “Con”; then fill in your email with the letter template. STAY TUNED FOR COVERAGE OF SURFRIDER’S TRIP TO THE CAPITOL!! San Clemente, CA (January 16, 2008) – Yesterday, Governor Arnold Schwarzenegger issued a letter in support of the proposed 241 toll road extension in South Orange County. The letter was issued just two weeks before a critical vote by the California Coastal Commission to determine if the proposed extension violates the California Coastal Act. A staff report prepared by the CCC concludes that it does. The disappointing announcement comes just six days after the California Governor unveiled his plans to close forty-eight California State Parks, allow for the early release of prisoners from state correctional facilities, and raise Department of Motor Vehicle fees. Governor Schwarzenegger’s failure to support San Onofre State Beach Park by endorsing the 241 toll road extension is in direct contrast to the efforts of his Republican predecessors, President Richard M. Nixon and then-Governor Ronald Reagan, both of whom worked to establish San Onofre State Beach as a part of their legacy; hoping that it would exist as a resource to be used and enjoyed by future generations. The Surfrider Foundation activists and other opponents to the planned toll road will be gathering in Oceanside, California on February 6th for a planned rally outside the California Coastal Commission hearing. All members of the public are invited to attend. Please go to http://www.savetrestles.org/ for more information. The Surfrider Foundation is a non-profit grassroots organization dedicated to the protection and enjoyment of our world’s oceans, waves and beaches. Founded in 1984 by a handful of visionary surfers in Malibu, California, the Surfrider Foundation now maintains over 50,000 members and 80 chapters worldwide. For more information on the Surfrider Foundation, go to http://www.surfrider.org/.